Egon von Greyerz continues: “But all manipulation ends in tears. The longer it takes before a market gets back to its unmanipulated equilibrium, the bigger the adjustment will be. In the meantime, investors believe that their portfolios will continue to grow to the sky. Nobody fears the fact that P/E’s are 80% above the average or that bond yields are around zero or negative in some cases. But in bubble markets not much is needed to change sentiment. There is a lot of talk about the Trump effect. Is the new US president going to continue to fuel market sentiment or will he cause a collapse? It is of course not Trump that will change the direction of markets. More likely, he could simply be one of the catalysts that will cause the credit and stock market bubble to burst. When markets are overbought, overvalued and overloved, there is not much needed to reverse the direction. And this is where we are now. 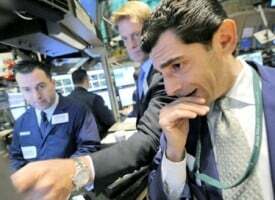 A change in sentiment and fear will make markets turn on a dime. In the short term, the gold price is a reflection of fear. 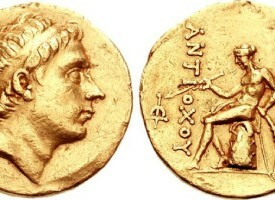 But in the longer term, all gold does is reflect the debasement of paper currencies. Since 1971, when Nixon abandoned the gold backing of the dollar, the US currency has lost 97% of its purchasing power. But since currency debasement is not noticed on a daily basis, its effect is never understood by the public. Few people appreciate that the increase in house or food prices is due to credit expansion and money printing. 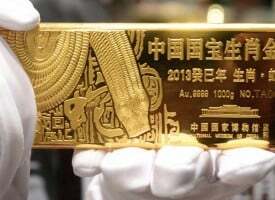 We will never see a headline like: “The dollar is losing purchasing power due to economic mismanagement,” or that gold is going up because the dollar is being debased. Since 2011, when gold reached a temporary peak of $1,920, we have seldom seen gold making positive headlines. In 2016 we saw the first signs of gold making the news again. But that died quickly as gold declined $250 from the July 2016 peak. The last commentary says it all, it will all go horribly wrong. That is the inevitable consequence of 100 years of credit expansion from virtually nothing to $250 trillion, plus global unfunded liabilities of roughly $500 trillion, plus derivatives of $1.5 quadrillion. This is a staggering total of $2.25 quadrillion. Therefore, the question is not what could go wrong since it is guaranteed that all these liabilities will implode at some point. And when they do, it will bring misery to the world of a magnitude that no one could ever imagine. It is of course very difficult to forecast the end of a major cycle. As this is unlikely to be a mere 100-year cycle but possibly a 2000-year cycle. It is also impossible to forecast how long the decline will take. Will it be gradual like the Dark Ages, which took 500 years after the fall of the Roman Empire? Or will the fall be much faster this time due to the implosion of the biggest credit bubble in world history? The latter is more likely, especially since the bubble will become a lot bigger before it implodes. The reason the bubble will expand first is that central banks worldwide will print unlimited amounts of money to try to save the financial system. The amount of money printing could easily reach the magnitude of total outstanding credit, liabilities and derivatives of $2.25 quadrillion. But that is unlikely to be enough since deficits will grow exponentially due to social security, pensions etc. Most people will find it very difficult to take these figures seriously today, but then nobody has the experience of the end of the biggest global debt bubble in history. We have seen many examples in history of what can happen in a hyperinflationary economy. 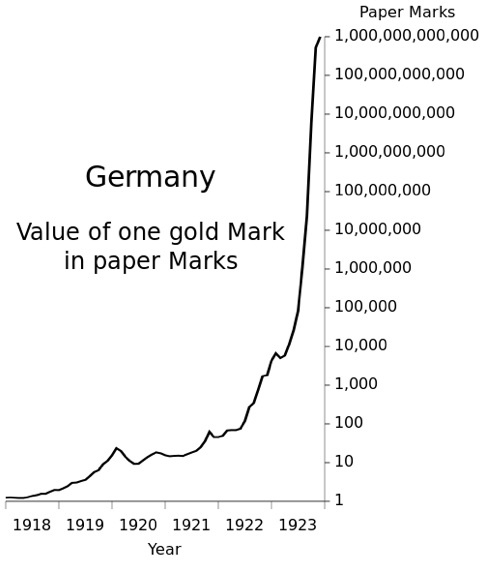 Take the Weimar Republic, for example, where the price of gold reached 100 trillion marks. 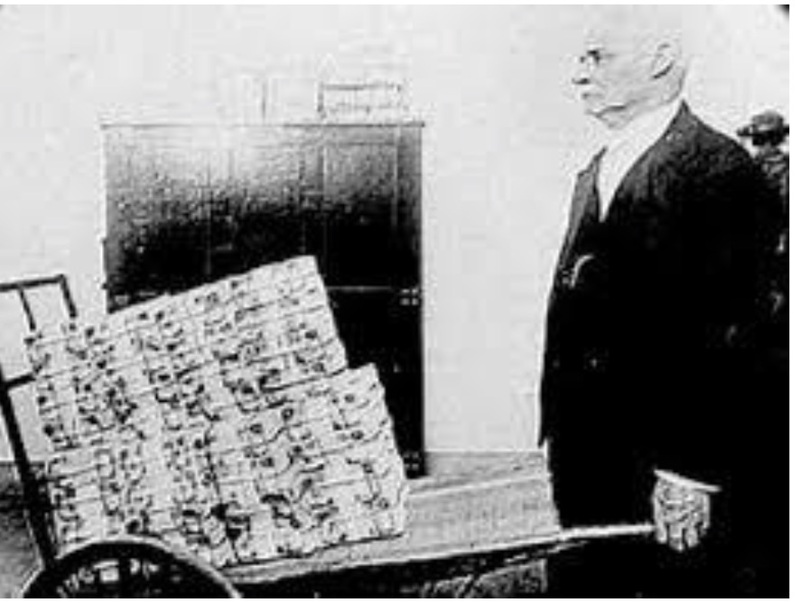 Hyperinflation often becomes a vicious circle that feeds on itself until the financial system collapses under the sheer weight of the worthless hyperinflationary money printed by central banks. We are not far from the moment when central banks will fail to expand the Ponzi scheme in an orderly manner. Hyperinflationary money printing will certainly not be orderly. Governments have neither the skills, nor the imagination to continuously delude the people that they are creating real money out of thin air. For some reason there is total trust today in debt instruments issued by governments through the central banks. As money printing escalates, this trust will wane. How can any sane investor buy a sovereign debt instrument that yields anything from a negative return to a marginal positive return? Especially since it is guaranteed that these debts will never be repaid, at least not in real money. 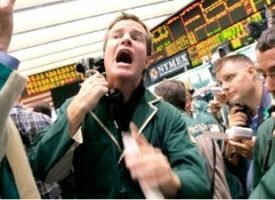 Will Target2 Crash Europe’s Financial System? Hard Target2 is an action movie with a life or death hunt in the wilderness. But as always, the real Target2 is a lot more exciting than the movie. Because the real Target2 can bring down the European Union’s financial system, and the consequences would lead to a global contagion, crisis and possible collapse. What is fascinating is that virtually no one is aware of Target2 or its ramifications. This is an EU scheme that few understand and even fewer realize the dire consequences of. Target2 is likely to cost European taxpayers at least €1 trillion but it could easily rise to €1.5 to €2 trillion or more. But as we know, the taxpayers have no money so it will be European governments that will have to foot the bill. But they haven’t got any money either and will of course print it. And this my friends is another guaranteed reason for hyperinflation. A Beppe Grillo victory in Italy or Marine Le Pen in France, could be some of the many triggers that will create havoc within the EU and its financial system. It would definitely make the €1 trillion of Target2 funding worthless. So what makes Target2 so dangerous? It is a Trans-European settlement system which facilitates the switching of liabilities from private banks to central banks and eventually to taxpayers. If a Spanish company buys goods from Germany, which is financed by its bank, this debt is sold to the Spanish Central Bank, that in turn refinances the debt with the ECB. The ECB in its turn raises money from primarily German banks and investors. The same thing happens if, for example, an Italian depositor wants to transfer his €1 million deposit from an Italian bank to a German bank in order to protect his money from the risk of devaluation or bail-in. 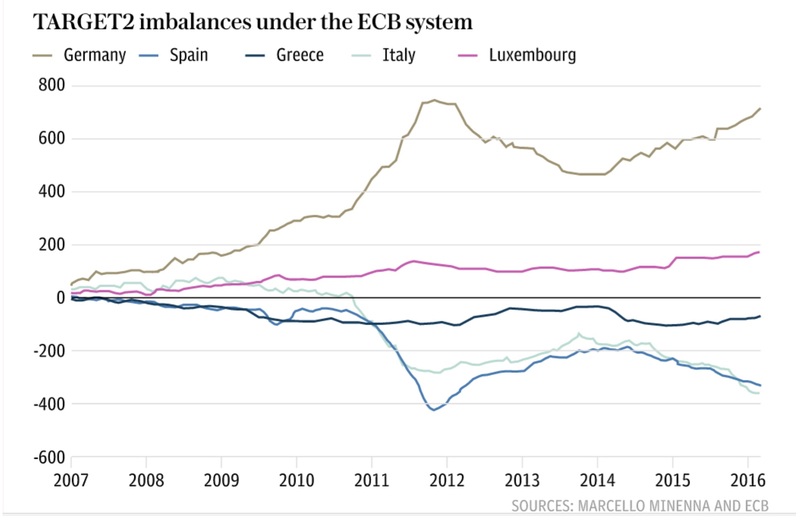 What we are seeing in Europe is a massive capital flight from the Mediterranean countries to Germany and Luxembourg. Many investment funds are based in Luxembourg. The consequence of this is that German investors have lent almost €800 billion to southern Europe, and Luxembourg investors €200 billion. The total of €1 trillion is guaranteed by the ECB and lent to central banks in Italy, Spain, Portugal and Greece. Through Target2, Spain is borrowing €328 billion, Italy €364 billion, with Portugal and Greece borrowing another €150B. The ECB has always considered Target2 to be a settlement system between European central banks rather than a financing vehicle. No rating agency has understood the consequences of Target2. We know of course that the Mediterranean countries will not and cannot repay up to €1 trillion. As often is the case, it is not the borrower who is in trouble here but the lenders. Therefore, Germany is in bigger trouble than Italy, Spain, or Portugal. Those countries can’t pay, so Germany will have to foot the bill. 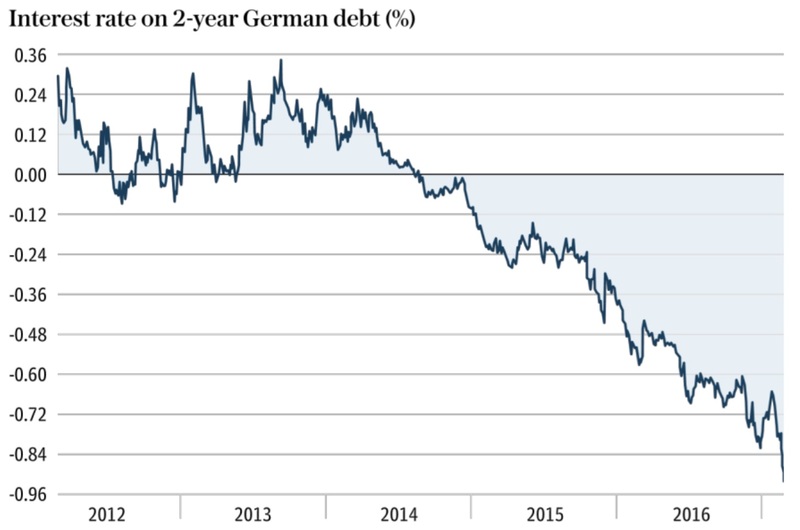 But German banks, led by Deutsche Bank, have extremely weak balance sheets and massive derivative positions. So they are in no position to settle. That leaves the ECB and European central banks which will need to crank up the printing presses. 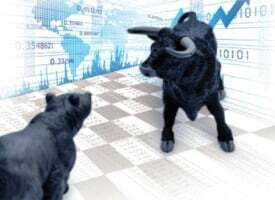 Let’s be very clear, the trigger that ends this economic Super Bubble could come from almost anywhere, whether it is Target2 in Europe, or another country such as China, Japan, the US or emerging markets. They all have insurmountable financial and economic problems. It looks like 2017 could be the year when many of these problems will be triggered. The precious metals are already signaling trouble as the newspaper headlines indicate. Gold is up 12% from the December 2016 bottom and silver is up 17%. Gold is likely to take out the $1,365 level quickly and probably make new highs before 2017 is over. The leading indicator for the metals is silver. When the gold-silver ratio turned down from the 84 level in February 2016, this was a clear indication of the end of the correction in the precious metals, especially since it coincided with an important cycle top. The ratio now seems to be in a similar position to where it was in August 2009. At that time, we saw an eight month move from 68 to 30 on the Gold/Silver ratio. A similar move this year would take silver to $65 if gold makes a new high. Thus silver could move up twice as fast as gold. KWN has now released the remarkable audio interview with London whistleblower and metals trader Andrew Maguire and you can listen to it by CLICKING HERE. 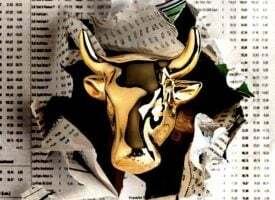 ***ALSO JUST RELEASED: One Of The Wildest And Most Shocking Bull Markets In History Is About To Unfold CLICK HERE.